For someone starting out, your lettuces and mesclun mixes are some of the easiest and quickly rewarding items to grow. You can grow them in little pots, big pots, and areas that don’t receive direct sunlight. They are fabulous for growing in limited spaces, such as apartments and on balconies or window sills. In fact, these little workhorses prefer cooler, damper areas, and although they grow quickest in direct sunlight, they will grow very well with bright light, even if there is little direct sunshine. If they get too much heat, they start to get bitter, and will start to bolt (send up seed stalks), so keeping them in that north facing window isn’t such a bad idea once they’ve started sprouting. 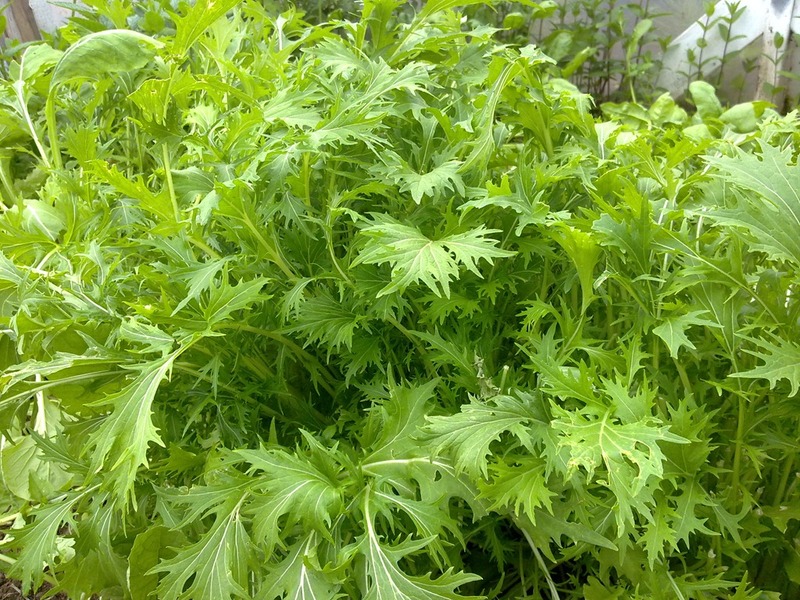 One kind of green in particular that grows in low-light and cold weather conditions is called Mizuna. It’s mature leaves remind one of dandilion leaves. It’s fantastic for winter growing, and low light conditions. I am here to tell you that this will be the greens that will get away on you with no encouragement. The picture above is of about a two foot planting of Mizuna, in our green house, and with five people in our family, and a couple of neighbours, this is what we ended up with. We couldn’t keep up! Once I got past the guilt of feeling like I was wasting food, I started concentrating on what a wonderful resource it is. A small pot on your window sill will undoubtedly go a long way! Has anyone else tried growing this? What were your results? This entry was posted in Organic Gardening and tagged cool weather growing, cool weather vegetables, growing mizuna, low light vegetables, shade vegetables. Bookmark the permalink.